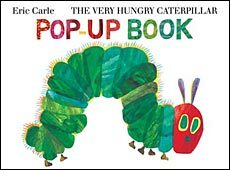 A pop-up version of Eric Carle's classic story of the hungry caterpillar who ate his way through an increasing number of various food items. Once full, he weaves a cocoon, then transforms into a butterfly. This pop-up version was created for the book's 40th anniversary. Tthere's nothing like a well-executed pop-up book, and this one is beautifully done. You've surely seen this classic title, perhaps from your own childhood. It's unquestionably one of the most popular number books ever. Transforming the story into pop-up format adds an extra element of fun. Below are sample spreads from inside The Very Hungry Caterpillar Pop-Up Book. You undoubtedly know the original book, but you MUST see the pop-up version. It's pretty great! The vibrant illustrations and fun depictions of food are really delightful! 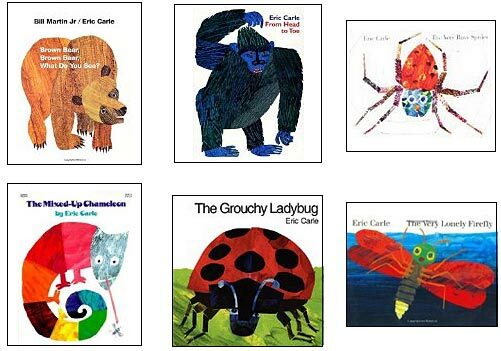 You may also want to check out other books by Eric Carle. All of his books are fabulous -- you really can't go wrong with a Carle! To learn more about his books, click on the book covers below or the link above and you will be connected to a listing of his books on Amazon.